“Did I order this?” asked a girl in her doorway. Her expression was perplexed, even blank, as she stared at the package enclosed in the wrinkled Jimmy John’s bag. She sluggishly concluded that it was hers and stumbled back inside to retrieve her 6-or-so dollars. Not to mention, she wasn’t wearing pants. Athens resident Kenzie Gilkey recalls this as one of the most “interesting” (and maybe most disturbing) moments as a Jimmy John’s delivery driver. She has been working at the fast food restaurant since August, and drunken encounters on the weekend come along as often as underage students at the bars. This serves as only one of a plethora of instances in which drunken deviants have distressed, entertained and overworked uptown employees. Working to ensure customer satisfaction, these employees diligently attempt to combat belligerence patiently and successfully. But where do they draw the line? The relationship between customer satisfaction and employee satisfaction is a fragile one, with one party noticeably favored over the other. Not surprisingly, employee satisfaction has more difficulty being reached than customer satisfaction. In Athens, Ohio, it might even be an impossible goal. The employees at Big Mamma’s, GoodFella’s, Jimmy John’s and Domino’s have experienced more than their fair share of drunken disasters, ranging from the ordinary to the unworldly. Between fights, sicknesses and a number of other bizarre instances, they’ve been conditioned to handle anything that may occur while on the clock. 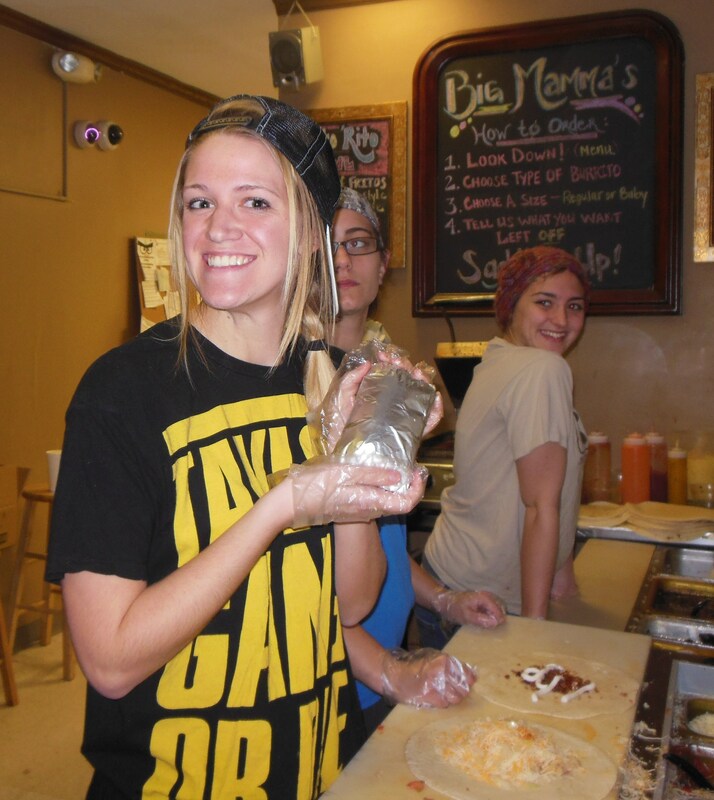 Sarah Cecil, a manager at Big Mamma’s, has been an employee there for about two and a half years. With that experience comes the baggage of satisfying challenging customers. “One time we had a girl walk behind the pop machine, squat and pee herself,” she said. Cleaning up the restaurants after impetuous customers has become almost uniform for the Court Street employees. Jimmy John’s employees experienced similar instances. “You always get the drunk girls that come in and puke in the bathroom,” affirmed Gilkey, acknowledging one of the more common occurrences at Jimmy John’s. Not only have customers left items behind, including wrappers, paper and plastic cups and vomit, but they tend to take what they want as well — rewards from their drunken endeavors. These occurrences happen at many of the late-night providers during the weekend. “If it’s not nailed down, it gets stolen,” Cecil said. 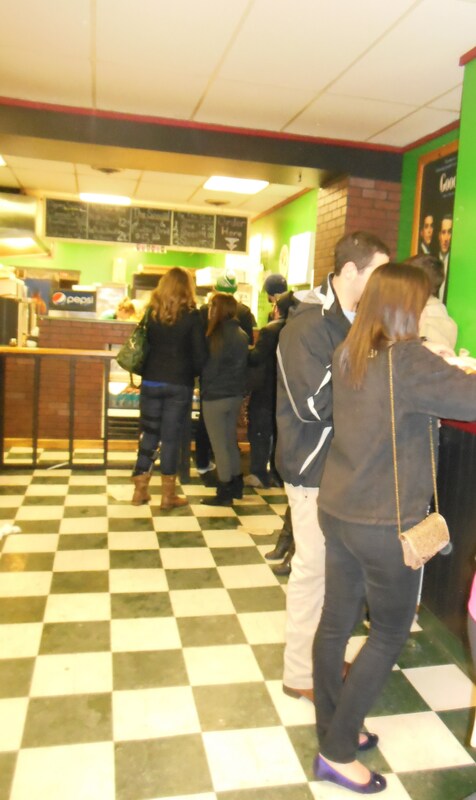 For instance, the giant chalkboard (the one that warned freshman about wearing lanyards) in Big Mamma’s on the left wall past the pop machine was stolen. The person ripped it off the wall completely and simply walked out of the store unnoticed. Big Mamma’s has to take extra precautions on the weekends to prevent thefts, Cecil claimed. They have to put the stools in the back so customers don’t steal them or use them as weapons against each other. GoodFella’s, home of great drunk food and great drunk people-watching. Photo provided. A girl known as “Tanna the Terrible” attempts to steal cups every time she comes into Big Mamma’s. Her flirtatious actions are thwarted by employee Colin Miner, who immediately recognizes her suggestive behavior as an attempt to steal some cups. “She’ll try to flirt with me to disarm me, and then she’ll go for the cups. I have to tell her, ‘No, you can’t have that,'” Miner said. The incessant issue of theft occurs not only at Big Mamma’s, but at the rest of the Court Street eateries. At Goodfellas, the issue of theft may be less severe, but a considerable number of items are still stolen by drunken posses. “People try to steal the condiments. People used to try to steal tips. Someone tried to steal the (pepper) shaker,” Joe Silas, an Athens resident who has been working at GoodFella’s since the beginning of the year, said. He recalled a moment when a customer and his girlfriend came into the store and tried stealing the pepper shakers in their pizza box. As the customer tried to leave, Silas told them to come back and return what he had stolen. His walk back to the counter was accompanied by a chorus of “boos” from the other customers in line. “He was embarrassed,” Silas admitted. In addition to the stealing and vomiting, one of the most obvious reasons employee satisfaction commonly cannot be attained is the constant influx of rude and unruly customers. Even Domino’s has had to go as far as calling the cops for the bizarre case of slumbering customers. “My very first day working, a drunk fellow came in and fell asleep in his pizza, and they had to call the cops to come get him. That has happened at least five more times since then,” Rachel O’Donnell, an OU graduate and 3-month employee at Domino’s, said. Customer rudeness takes an obvious form in physical disputes. Almost every restaurant uptown has been besieged by a number of short-tempered students and residents, prepared to brawl at any nonsensical but-I’m-drunk-so-it’s-okay reason that they can find. Employees at Big Mamma’s have witnessed both male and female fights, some of which have resulted in the employees physically removing the assailants from the restaurant, Hicks said. “There is a fight in here [at GoodFella’s] about every other weekend,” Nieman said. So, between the messes, stealing, fighting, rudeness and misunderstandings, one can’t help but wonder, is this all in the job description? Can employee satisfaction ever actually be achieved, or are Athens employees forever destined for customer disappointment? Like any corporation, maintaining a respectable employee-customer relationship is one of the most imperative responsibilities, but for restaurants in Athens, do the out of control customers hinder the obligation to establish a healthy relationship? “We can’t guarantee an awesome relationship, but we practice a polite but firm policy with customers,” Nieman said. In some cases, the regulars at a restaurant make the job more interesting and worthwhile. A regular, Matt, often comes into Big Mamma’s while intoxicated and tends to give them a 100 percent tip, Cecil said. Employees are also entertained by the quirky customers who make appearances at their restaurants during both daytime and nighttime. “This one girl comes in always wants a chipotle ranch (burrito) with no tomato because she’s allergic to tomato and cats. So now we always make fun of her and say, ‘Here’s your burrito…with no tomatoes and no cats,’” Cecil laughed. Another customer, a Jimmy John’s regular, frequently comes in and orders two number fours (the Turkey Tom). She buys one sandwich for herself and one for her dog, said Cole. In other cases, however, experiences with pleasingly eccentric customers can’t always be guaranteed. A regular at Jimmy John’s comes in on a daily basis, asking to buy 10 loaves of day-old bread when he knows the Jimmy John’s policy only allows the purchase of five loaves at a time. Depending on the day, the employee and his often-pristine persuasive skills, he can either purchase five or 10 loaves. “It irritates me because he tries to act dumb when he knows what’s going on,” Cole said. Colleen Hicks and her fellow Big Mamma’s employees have seen many a drunken adventure on a typical weekend. Photo provided. Even if the amiable customers don’t make up for the scheming, stealing and hassling regulars who meander into the restaurants, the positive attitude of the employees is a main component to acquiring their own satisfaction. If any job in general merely requires patience and a positive attitude, the ones in uptown Athens require an incontrovertible need for composure and an aptitude for humor. Having an optimistic outlook might even help improve their seemingly never-ending work shifts. “There’s a good mix of people — half of the people drunk are mean, half are nice and will make your night. Some are just a–holes,” Miner said. As one would imagine, a positive attitude is essential for having a successful (and possibly even enjoyable) night, and the attitude of these employees makes an uptown job seem not so horrible or painstaking. “I like to keep the customers laughing,” Cecil said. Even more so, the craziness of working uptown brings employees together, forming friendships and making their jobs more bearable and, strangely enough, pleasant. “I love it. Dealing with all the craziness, you get really close to the people that you work with. 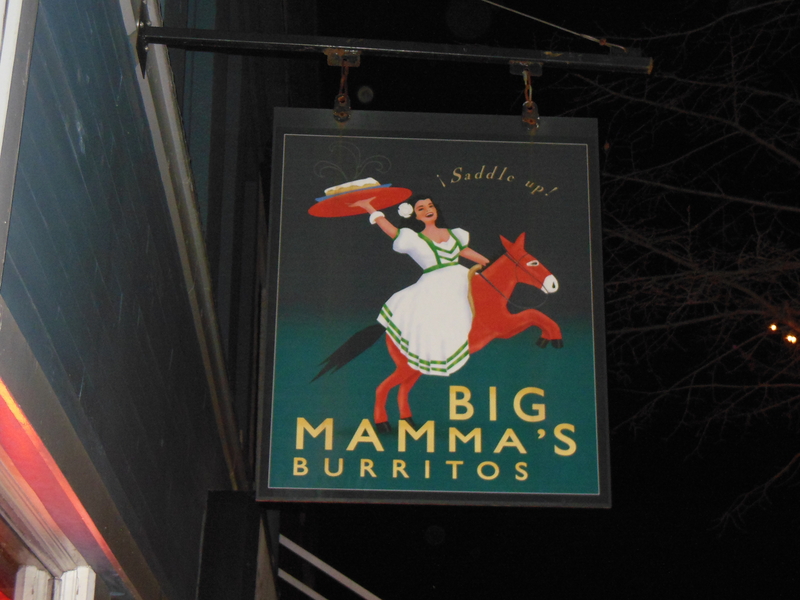 You’re going through the same stuff, so most of my best friends, I met [at Big Mamma’s]. It gives you a lot of good stories to tell, definitely, and [gives you] experience dealing with people,” Hicks said. Life as an uptown employee, indeed, has its benefits, but the customer satisfaction is realized (and forgotten) much more often. Though it is expected, the chaos of every weekend night leaves the employee void deprived of satisfaction. With the continued drunken weekends in Athens, however, the only satisfaction gained for now will be by the ravenous, I’m-so-wasted customers greedily shoving Big Mamma’s burritos into their mouths. Ok, I was technically working on State and not Court, but darned close. I’ve had a girl change her tampon in the middle of the floor, leave the old one behind, and leave.